A great option for those who do not have their own transport when staying in Orlando. Your ticket includes all the benefits of the Kennedy Space Center Admission Badge combined with returned coach transportation from Orlando. Tour NASA’s spaceport and see space shuttle launch pads from a four-story observation gantry. 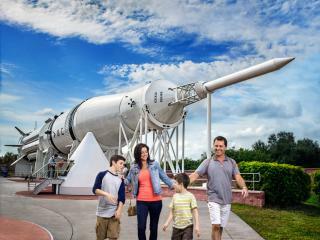 Walk beneath a massive Saturn V rocket and relive Neil Armstrong’s first steps on the moon. Meet a real Astronaut, stroll through the Rocket Garden, and enjoy five-story IMAX® space films. Take a virtual moonwalk and feel the pull of 4 g’s in the G-Force Trainer Centrifuge! Guided tour of the amazing Space Shuttle Atlantis exhibit - this fantastic new exhibit showcases Atlantis as if it were in space - raised 30 feet off the ground and rotated 43 degrees - and also tells the compelling story of the entire shuttle program. More than 60 interactive, immersive exhibits and simulators provide a never-before experienced perspective on the shuttle’s complex systems, components and capabilities. Take the NASA Bus tour with stops at the Observation gantry to see the launch pads and the Saturn V exhibit area. Watch breathtaking 3D space films at the IMAX® cinema. Walk through the impressive Rocket Garden. Visit the Exhibitions on Early Space Exploration and Exploration in the New Millennium. Touch a piece of Mars. Ride the incredible Shuttle Launch Experience and experience full-on G-Forces. The Kennedy Space Center with Transportation operates daily year round. The tour picks up from various central locations in Orlando between 7.15am and 8.30am departing for Kennedy Space Center Visitor Complex at around 8.30am. Transfer time to Kennedy Space Center Visitors Complex is around 1.5 hours.